The dolphin species Delphinus delphins was well distributed throughout the Mediterranean basin and was considered the most abundant cetacean species many years back, thus is referred to the Common dolphin. However, in the last decade its abundance has been reported to be in steep decline in some Greek and Italian waters with notable population remaining in the Alboran Sea and in Maltese waters. For this reason, The Biological Conservation Research Foundation (BICREF ngo Malta), Oceanomare Delphis Onlus (ODO ngo Italy) and OceanCare, co-organised the 1st International Common dolphin Workshop focusing on the Conservation Research and Networking in the Mediterranean which was held in Ischia last April. Dr. Adriana Vella, Ph.D (Cambridge), long-term cetacean researcher from the Maltese Islands was invited to participate and contribute to this important event. She had already been involved in the co-organisation of the 1st International European Cetacean Society workshop on Common Dolphin Workshop in 2004 held in Sweden. Dr. Vella, conservation biologist, is senior academic and leader of the Conservation Biology Research Group from the University of Malta. She was the scientific committee chairperson and key organiser of the 29th European Cetacean Society Conference held in Malta for the 1st time in 2015. This event had brought to Malta cetacean scientists from all around the world to present and discuss scientific results for cetacean conservation from local to global. Dr. Vella has been active in local field research on dolphin, whales, turtles and various other marine species since 1997 by undertaking both aerial and marine surveys. With a 25nm management conservation zone, newly established marine protected areas and European/Mediterranean Directives, Frameworks and Agreements the status of the various species requiring conservation benefit from independent and scientific research especially with increasing anthropogenic threats. So this unique Maltese research effort by Dr. Vella is one of the few found around the Mediterranean to have managed to sustain such demanding research through time and through different seasons of the year in order to obtain a more accurate assessment within the variable Mediterranean seasonal and inter-annual variations. Common dolphins may be considered an important flagship species for the protection of marine life and biodiversity away from our everyday sight. 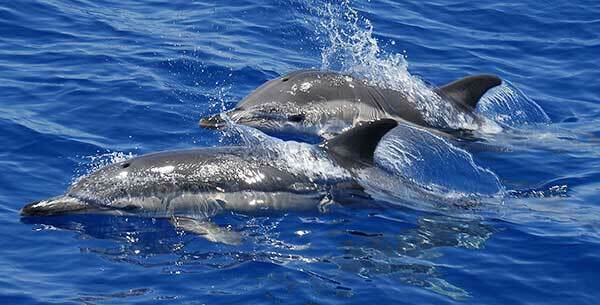 In Maltese waters the research by Dr. Vella, together with other researchers from around the Mediterranean, was instrumental in promoting the common dolphin population as endangered in the Mediterranean in 2003 (IUCN Red List). Sustained dedicated research by Dr. Vella assisted by BICREF volunteer members has allowed long-term monitoring of this species showing that the local population still persists but with changing environmental conditions it may move away or disappear, unless tangible integrated management action is implemented in the near future. Between the 18th and 20th of May the Ist Mediterranean Gap Analysis for Cetaceans and Turtles has been organised in Nice, France where Dr. Vella has also been invited to contribute to this other regional effort to promote effective future monitoring and conservation of these species. The general out come from all these events indicate the important relevance of long-term and year-round research for these vulnerable and long-lived marine species. The work by the CBRG-UoM and BICREF are directly targeting this while incorporating various biodiversity studies at various levels.